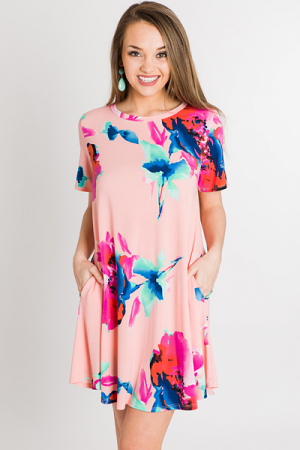 If you've been on the hunt for THE perfect tshirt dress, stop your search because this is the one! An appropriate length, simple neck line, rolled sleeves, and pockets... ohhhh yes! The poly rayon-blend fabric feels like a dream, which just makes it even better! Pull on fit. Available in 4 colors! Shoulder to hem measures approximately: S- 36.5" M- 37.5" L- 38" XL- 38.5"